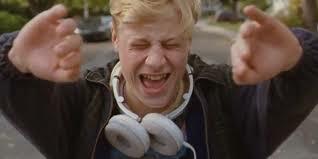 This movie begins with a car accident – perhaps writer/director Xavier Dolan’s way of saying “fasten your seatbelt” because you’ve never seen anything like Mommy! The film takes place in Canada, in the near future, where a law has been adopted stating that parents must either take responsibility for their emotionally disturbed children or send them to a detention center. But the movie is really a psycho-drama about three very damaged people – a mother, her son and their neighbor. Steve has ADHD (and I’m sure many other psychological issues). He’s not wired quite right. But then again, his widowed, working-class mother Diane doesn’t have it together either. Steve is thrown out of school and now he’s Diane’s problem. He can be violent, but also charming and manipulative. He is unlikeable and disturbing to watch. Diane hopes that love will conquer all but mother-son conversations are more like explosions and their relationship borders on incestuous. How to home-school a boy like this? Kyla, a stuttering neighbor with her own mysterious problems, is a school teacher who steps in to help and becomes part of this dysfunctional trio. Friendship and love try to temper the violence, but can any of them be saved?